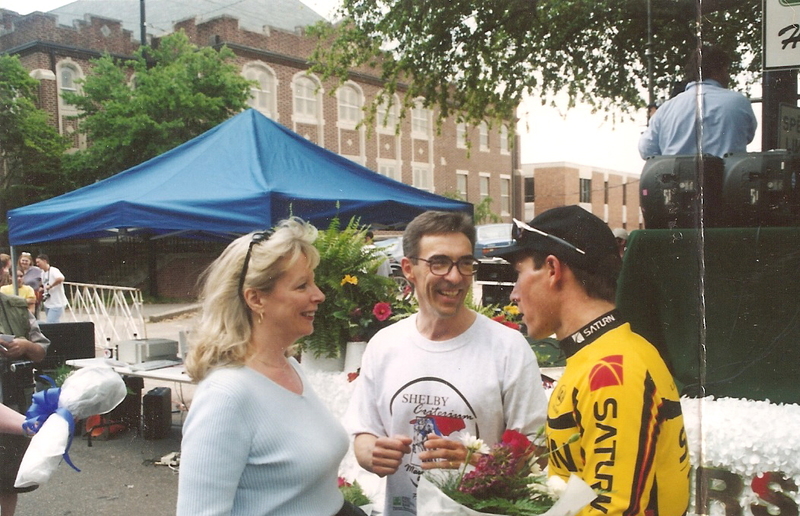 I found this picture of an annual cycling event that took place in Shelby, North Carolina from 1996 to about 2000. It was “The Shelby Criterium” a closed looped course in the uptown area. Mike Keeley served as director. The above picture is Pro Elite Cyclist, Eric Wohlberg who was riding for Saturn/Timex at the time, my wife, Debbie and myself. Wohlberg finished second during the year pictured. His career spanned at least 20 years. He was a three time Olympian, winner of the Tour of Gila (a stage race held in New Mexico) and seven time Canadian Time Trial Champion (1997-2003 Gold) and (2004-2005 Silver). Eric became very good friends with Mike Keeley, and would stay at his house when racing in the criterium. I also became friends with Eric and would share an occasional email with him on occasion. Mike and I were also fortunate to have been able to do some bicycle rides with Eric, and also share some good conversation, both on the road and at a local coffee shop. This entry was posted on October 24, 2011 at 1:14 am and is filed under Roger's Articles. You can subscribe via RSS 2.0 feed to this post's comments. Both comments and pings are currently closed.